My first plant seems to be quite slow growing, and I rather hope it's happy to stay being a pepper shrub. It's planted in the native border over the water race, in the company of flaxes and small pseudopanaxes, and is quite reddish in leaf colour. I also grow another Pepper tree in a medium sized pot. It's a beautiful look, and I'm sure the tree/shrub will be happy here. The plan is to plant it in the garden after a few years - a good excuse to buy a replacement. 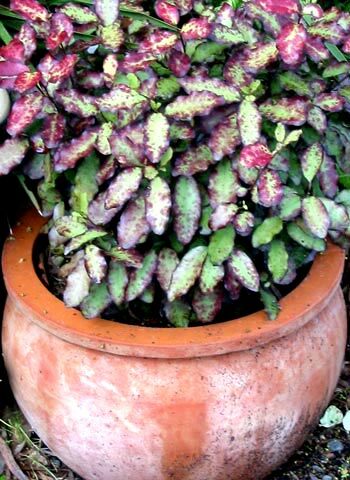 You can see from the photograph what a wonderful container plant it is - super stylish! It was taken in late Autumn - it's possible that the colours have faded just a little. I know there are different Pepper Trees in the world, so I checked in my New Zealand shrubs reference book. The New Zealand Pepper Tree has the proper names Horopito or Pseudowintera colorata. The leaf variegations on these small shrubs must be some of the most beautiful to be seen. They are evergreen performers year in year out.